How do you get the 99.99% purified water and an unbelievably clear pool? By supplementing your pool sanitation with powerful ozone, you reduce chemical demand by up to 85%, destroy chlorine-resistant germs (even Cryptosporidium! ), capture the finest particles to increase clarity, and greatly extend the lifespan of your salt cell. 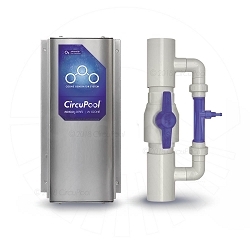 Adding a CircuPool INDIGO3 ozone generator is an incredibly effective way to upgrade your salt chlorination system. It gives you the ideal combination of powerful oxidation with safe, gentle residual protection in the pool water - that means you have the most complete spectrum of protection for your swimmers. 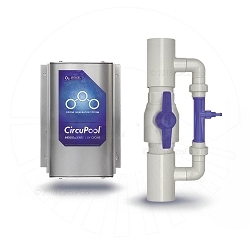 In fact, the combination of a CircuPool ozone generator and salt chlorinator gives you such advanced pool sanitation that its similar to technology used to make purified bottled water - comparable to other high-end pool systems that can cost over $3500! Why add Ozone? The INDIGO3 quickly purifies chlorine-resistant contaminents, provides high-definition water clarity, & extends salt cell lifespan! Why add Ozone? The INDIGO3-XL quickly purifies chlorine-resistant contaminents, provides high-definition water clarity, & extends salt cell lifespan!